The subject of this blog post came from a Kickstarter question: "Does this support 3.5?" "This" refers to the next adventure I'm writing, Revelry in Torth. "3.5" refers to that late-middle period of Dungeons & Dragons which helped propel the Old School Renaissance into existence. Indeed, 3rd and 4th editions practically forced nostalgia-fueled grognards to become a like-minded community, continually hashing out what is and what isn't OSR while enjoying the melange of overlapping and polarizing tastes it has to offer. After a little back and forth, I gave his query two different answers. In the way that Revelry in Torth will include Hit Dice, Hit Points, Armor Class, etc... yes. It's "supported", meaning compatible. However, beyond that, no. 3.5 is not just like OSR, O5R, or anything calling itself old school. Aside from a few conversion issues, there's something else at work here, a deeper issue. Where 3.5 tried to standardize the game. I and the OSR go in the opposite direction - non-standardization! My aim is to make things as unfamiliar and strange as possible, while staying within the loose confines of D&D's core principles. NPCs and monsters will have special abilities and powers and various game mechanics; however, they will not resemble the rigid and bloated stat blocks of 3.5. 3rd edition, like 4th, is a different animal than original D&D, AD&D, 2nd edition, and now 5th. The majority already know this. Gamers like myself don't want hardwired rules for everything and everything to be explicitly stated in the rules. We want grey areas. We want room to do our own thing, to explore the weird and wild game flow just as player-characters might explore a subterranean environment. It's not just about the mechanics. It's a totally different style of tabletop fantasy roleplaying. 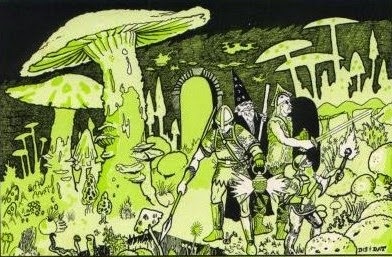 The early editions focused on improvisation, collaborative storytelling, and interacting with the unknown rather than rules knowledge and character optimization in order to "win D&D". I can only hope that 5th edition carries on that unorthodox tradition, that feeling of apprehension when facing a stairway leading down to the next level of the dungeon. So, those looking for "a proper conversion up to 3.5" will be sorely disappointed in the vast majority of OSR, O5R, and similar products. Yes, the extra GM prep is an issue but, more than that, they are aesthetically antagonistic.